Cape Cod, MA – May 24, 2011—Windwise Cape Cod is an alliance of neighborhood organizations and dedicated individuals who joined together to promote a more open dialogue on the planned proliferation of wind turbines. Windwise supports a reasoned consideration of the economic feasibility and the adverse effects of wind turbines on Cape Cod. 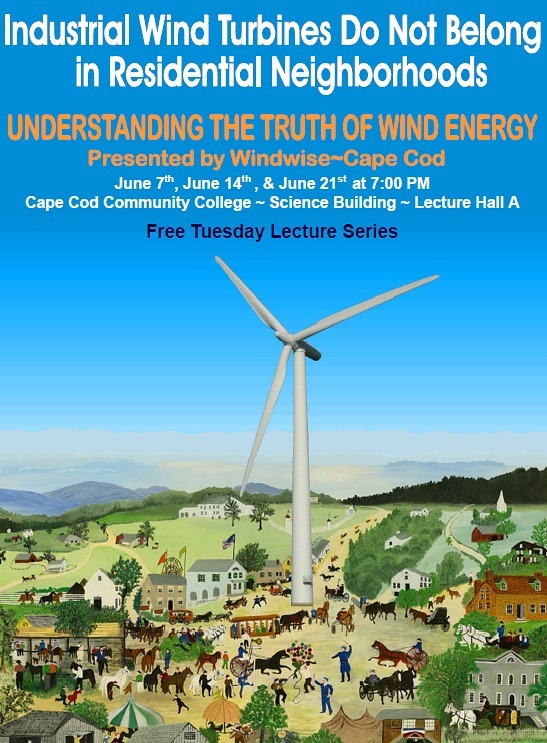 To this end, Windwise Cape Cod is sponsoring a free lecture series at Cape Cod Community College on the first three Tuesdays of June. The “Understanding the Truth of Wind Energy” series includes presentations by leading national and international experts who will present the latest research on many aspects of wind energy. Of special importance will be the presentation on Tuesday, June 14th. Two of the leading international experts on the health risks of wind turbines will present via WebEx. Dr. Nina Pierpont is the author of the most influential book on health problems caused by wind turbines, Wind Turbine Syndrome: A Report on a Natural Experiment (published 2009) and Dr. Sarah Laurie will present from Australia. Dr. Laurie is one of the founders of the Waubra Foundation in Australia, which is devoted to supporting national and international cooperative research initiatives on the health risks of wind turbines. » Tuesday, June 7th, 7 pm Cape Cod Community College, Science Lecture Hall A. “Wind: So What’s the Problem?” presented by Lisa Linowes. Ms. Linowes is the Executive Director for the Industrial Wind Action Group, a national advocacy group focused on the impact/benefit analysis associated with industrial wind energy development. Her presentation will review current energy policies, the scale of proposed wind development nationwide and in Massachusetts, and whether our policy goals adequately satisfy the public’s need for clean, low cost, and reliable energy. 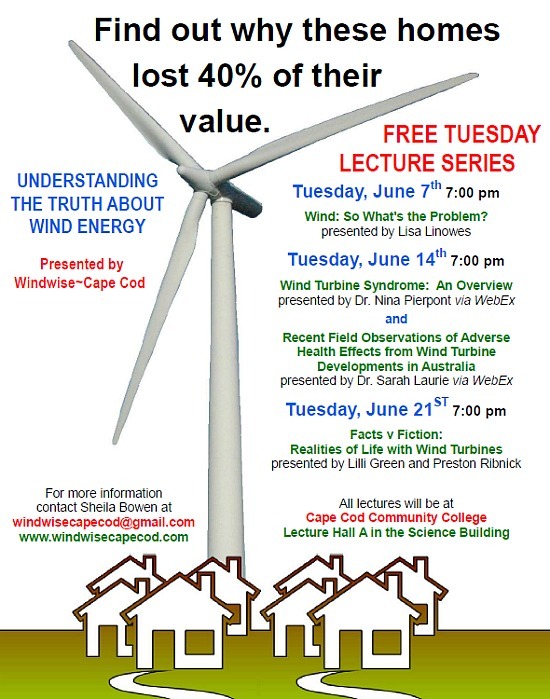 » Tuesday, June 14th, 7 pm Cape Cod Community College, Science Lecture Hall A. “Wind Turbine Syndrome: An Overview” presented by Nina Pierpont, MD (Johns Hopkins), PhD (Population Biology, Princeton), via WebEx. Dr. Pierpont is the author of the peer-reviewed book Wind Turbine Syndrome: A Report on a Natural Experiment, the most influential book published on the health risks of wind turbines (www.windturbinesyndrome.com). She is the leading global authority on this topic and has been interviewed by news organizations and has testified in governmental hearings and court cases around the world. “Recent Field Observations of Adverse Health Effects from Wind Turbine Developments in Australia,” presented by Sarah Laurie, MD (Flinders University, Australia), via WebEx from Australia. Dr. Laurie is a former rural family physician and one of the founders of the Waubra Foundation in Australia which is devoted to supporting national and international cooperative research initiatives on the health risks of wind turbines. 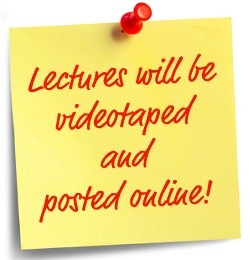 All lectures will be presented in Science Lecture Hall A, near Parking Lot 7, at Cape Cod Community College, 2240 Iyannough Road (Rt. 132) near the Burger King at Exit 6 off the Mid-Cape Highway (Rt. 6), West Barnstable, MA 02668. Windwise Cape Cod is an alliance of community organizations and citizens formed to have a stronger voice in response to the rapid proliferation of wind turbines proposed and planned for the Cape, Islands and South Coast. The mission of Windwise Cape Cod is to make complete and accurate information on wind energy available to residents, town governments, and state legislators. In addition, Windwise Cape Cod provides support and guidance to groups and citizens who want to bring information and expertise about wind turbines to their communities. Dear friends, I am so glad to see that people are realizing the dangers and risks of having wind turbines close to home. Unfortunately, in my small community in the name of progress and saving energy some dishonest people from Mass. are pushing to install some towers close to my home. I do not know what to do, except write an article to the local newspaper to make my neighbors aware of the problem, and inform the town officials that these risks really exist. There is going to be a meeting next month, June 5, so I am not able to assist at your meeting, but I would like to get in touch with any of your speakers so they can help me with ideas and maybe they can (the ones that live closer) can come and instruct us in this serious matter. My name is Clara Osorio, I am a physician and I have my Masters in Public Health and MBA. I live in a very small village in New Hampshire, Milan. The project is for Berlin, New Hampshire, but the mountain where they want to put it is less that a mile from home. I can see the mountain from my house. I have children and I love to live here, so I do not want to see this ruined because of this project. Note: Is there any way Mrs Lilli and Mr. Preston can get in touch with me? I would like to talk to them. If it is possible, please give them my e-mail.